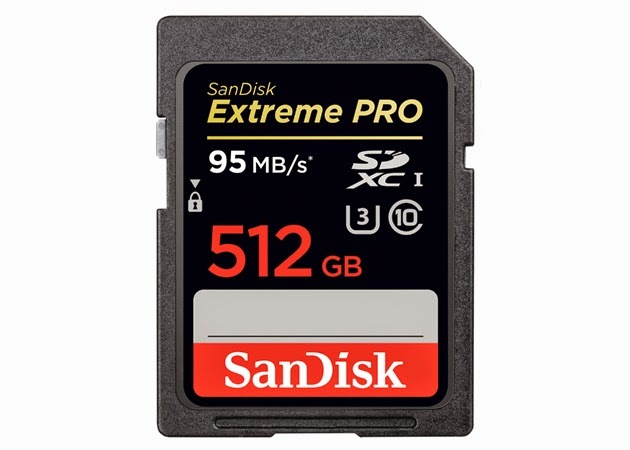 SanDisk Corporation, a global leader in flash storage solutions, today launched its 512 GB SanDisk Extreme PRO SDXC UHS-I memory card, the world's highest capacity SD card on the market. The new offering is designed to meet the demands of industry professionals who require the most advanced gear available for shooting 4K Ultra High Definition (3840x2160p) video, Full HD video (1920x1080) and high-speed burst mode photography. "As an industry leader, SanDisk continues to push the boundaries of technology to provide customers with the innovative, reliable, high-performance solutions they have come to expect from us," said Dinesh Bahal, vice president, product marketing, SanDisk. "4K Ultra HD is an example of a technology that is pushing us to develop new storage solutions capable of handling massive file sizes. The 512 GB SanDisk Extreme PRO SDXC UHS-I card is a tremendous advancement that enables professionals to reliably store more content on a single card than ever before." Since SanDisk unveiled its first 512 MB SD card in 2003, capacity demands have increased exponentially and the new 512 GB SanDisk Extreme PRO SDXC UHS-I card represents a 1,000-fold capacity increase in just over a decade, yet maintains the same size footprint. SanDisk's most powerful and highest capacity SD UHS-I memory card yet, the 512 GB card delivers write speeds up to 90 MB/s and UHS Speed Class 3 (U3) recording speed for high resolution, real-world color and stutter-free 4K Ultra HD video. Transfer speeds up to 95 MB/s move data quickly for efficient post-production workflow. The 512 GB SanDisk Extreme PRO SDXC UHS-I card delivers both the speed and capacity needed to support 4K Ultra HD video capture, enabling users to shoot tremendous amounts of content without disrupting the moment. RescuePRO Deluxe data recovery software download offer, for bringing accidentally deleted images back to lifeSanDisk Extreme Team member Sebastian Devaud, renowned director and producer, relies on cutting edge technologies to continuously advance his productions. "I am always interested in new technologies to help improve how I work and the quality of my results," said Devaud. "With higher capacities, I have greater flexibility to capitalize on the moment and let the camera roll without worrying about the performance of my equipment." "The new 512 GB SanDisk Extreme PRO UHS-I card offers incredible speed and capacity," said Grant Petty, CEO, Blackmagic Design. "Our Pocket Cinema Camera customers shoot in every type of circumstance and location, and get amazing wide dynamic range RAW images capturing the brightest highlights and darkest shadows at the same time. The additional capacity of the SanDisk Extreme PRO UHS-I card will extend the creative freedom for our customers shooting in RAW and open up the ability to use wide dynamic range RAW files with even more productions." The SanDisk Extreme PRO UHS-I SDHC/SDXC memory cards are available worldwide in capacities of 512 GB, 256 GB and 128 GB. The 512 GB Extreme PRO SDXC UHS-I card will be available for $799.99 (MSRP).